5 Printers Row is an exceptional and architecturally unique rural home in Balfron, Stirlingshire, set against the stunning backdrop of the Campsie Fells. 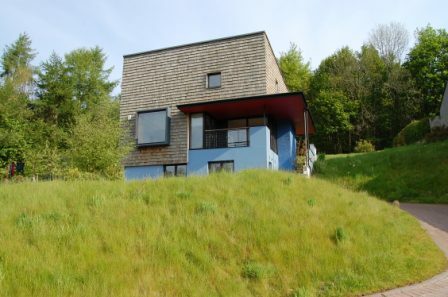 Featured on Channel 4' Grand Designs' in 2006, this contemporary family house has recently been put on the market by CKD Galbraith. The property brings an international flavour to this part of Scotland with its external contemporary box design built in the Dutch style and Canadian cedar wood forming the facade of the house. The building is arranged on three levels with lower level concrete plinth and two storey Scandinavian timber framed system affording exceptional thermal benefits. With a heat recovery system and high quality triple glazed windows, the house is as energy efficient and sustainable as possible. Inside, 5 Printers Row boasts unique architectural features throughout with stunning open-planned, double-height interior spaces, under-floor heating, beautiful solid oak flooring, and fixtures and fittings of the very best quality. The roof light slot and large windows on every side of the building maximise the amount of natural light and allow magnificent views of the surrounding countryside. Covering a floor area of around 192 sqm, the property accommodates family and living social spaces on the ground level. The upper floor comprises the master bedroom with four piece en suite bathroom, two further bedrooms, a family bathroom with a Jacuzzi bath, and study overlooking the living area, with the lower floor accommodating guest bedroom, hobby room and storage. Dominic Wedderburn, who is handling the sale for CKD Galbraith said: "This is a contemporary masterpiece with a decidedly international flavour. It's a one-of-a-kind modern property with a homely feel, offering light, comfort and luxury." 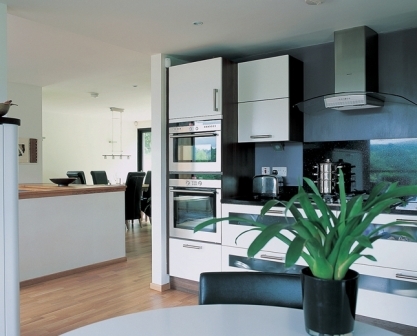 Balfron has an excellent range of local services and is situated close to The Loch Lomond and Trossachs National Park, with its world famous scenery with a plethora of recreation and outdoor leisure opportunities nearby. Glasgow and Stirling are only a 20 minute drive away. 5 Printers Row is for sale at offers over 425,000. Find out more about this property.